Last week when the Senators were in Southern Florida taking on the Panthers, two friends of mine really got into it. I wasn't there to break up the fight so I just let them go at it and get rid of their frustrations. 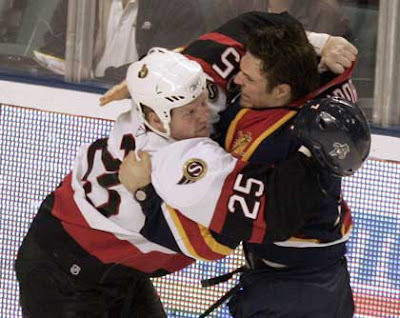 Chris Neil and Steve Montador play with reckless abandon (which I love) and the accompanying photo caught them mixing it up. Maybe they were arguing over whether fighting should be banned in hockey. Then again, maybe not! Hey Chris, you can't afford to lose any more teeth! What a great picture- you can really see the intensity they both play with! (Although, I'm glad I'm not the one that had to get between them to break it up!! ).